DCCA recognized Fry & Company for its sponsorship of the recent sold out A Taste of Wine & Jazz fundraising event. 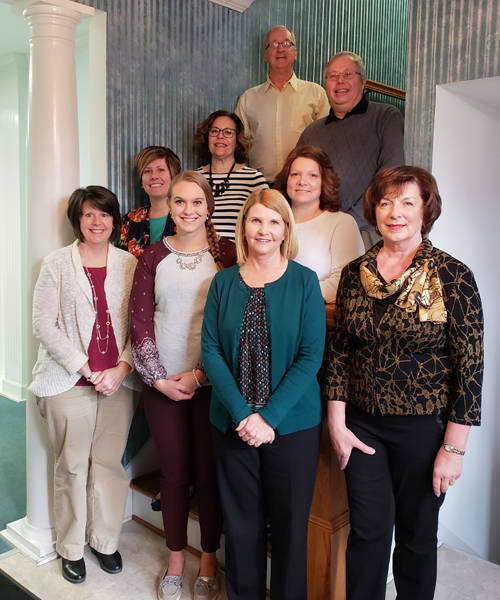 Pictured are Fry & Company certified public accountants (bottom row, l-r) Julie Strait, Heather Dirksen, Ginger Thomas and Bev Delk, (middle row, l-r) Jessica Gower, Becky Luce and Melissa Wilson, (top row, l-r) Jim Ward and Rodney Oda. GREENVILLE – Darke County Center for the Arts recognized Fry & Company for its sponsorship of the recent sold out fundraising event A Taste of Wine & Jazz at the Montage Cafe. A Taste of Wine and Jazz included four wines for tasting, complemented by hors d’oeuvres created by Aaron and Michelle Cox of Montage. “Deron Bell And The Jazz For You Band” returned to bring the party to life. Bell and his “Jazz For You” band has earned a large local following. “Deron and the band are extremely skilled musicians who love to play and are dedicated to making sure that their audience has a good time,” DCCA Artistic Director Keith Rawlins said. The band’s performance was made possible by the following sponsors: Kent and Melinda Myers; Edward Jones Investment representatives Zachary Bruening, Dave Connelly, Ryan Carpe and Todd Subler; Family Health; Geoff and Jessie Surber; and Zechar Bailey Funeral Home. A Taste of Wine & Jazz is a fundraising event for DCCA; proceeds are used to help underwrite the cost of presenting high quality performing artists in Darke County, as well as preserving Henry St. Clair Memorial Hall as an important cultural center. For upcoming events or further information on the Darke County Center for the Arts, contact the DCCA office 937-547-0908 or visit its website at www.darkecountyarts.org.